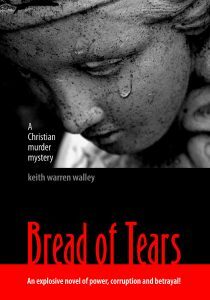 Bread of Tears – A Christian Murder Mystery, by Christian author Keith Warren Walley. An explosive novel of power, corruption, betrayal and murder. A once vital church comes apart and it will take hard work and courage for those who remain to put the pieces back together. Scott Henry is called in to investigate financial mismanagement. A new board has been elected and too many questions remain unanswered. But what Scott finds doesn’t stop at church finances. Members of the old board were up to much, much more. With support from the new board, and some members of the congregation finally coming forward, the web of deceit, a high flying lifestyle and flagrant disregard for others finally emerges…with shocking results.